Pacific Standard Time, a collaborative art effort that will spread across Southern California, through 70 institutions and 65 galleries, is back this September. Through January 2018, Pacific Standard Time: LA/LA will explore Latin American and Latino art past and present. From ancient artifacts to contemporary visual art and performance, Pacific Standard Time’s scope is vast, eclectic and full of surprises. Individual exhibitions focus on single artists, or specific countries. The collections highlight spirituality, politics, murals and more. They document 20th century Chicano history, art during times of upheaval throughout Latin America and often put the spotlight on artists whose work is infrequently (if ever) shown in Los Angeles…. Los Angeles is a city of murals. 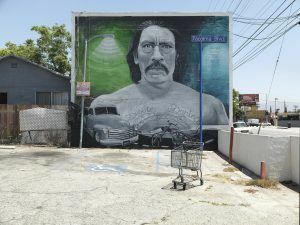 From the northern end of the San Fernando Valley to the southern reaches of San Pedro, art lives on this city’s walls. For Pacific Standard Time, interdisciplinary artist and 2017 Guggenheim Fellow Ken Gonzales-Day collaborated with Skirball Center for an exhibition that is as much about Gonzales-Day’s photography as it is about the art that fills Los Angeles. Gonzales-Day spent 10 months traveling through Los Angeles to photograph street art. In the end, he developed a catalogue of images that include both anonymous artists and big names in the mural world, capturing the both the artist’s work and the neighborhoods in which they are housed.